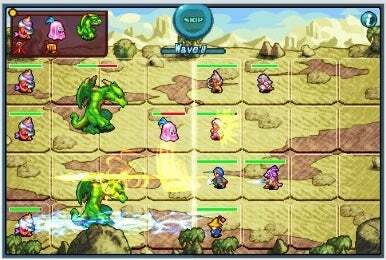 Square Enix, publishers of the famed Final Fantasy series of video games, announced Wednesday the release of Crystal Defenders: Vanguard Storm for the iPhone and iPod touch. It costs $5, and a free "Lite" version is also available. Vanguard Storm borrows from tower defense games, but features a very Square Enix-style look and feel. The Crystal Defenders series is Square Enix's take on the popular "tower defense" game genre, in which players protect resources from an invading army of monsters by strategically positioning units that can stop the monsters in their tracks. The game sports jobs, or units, from Square Enix's "Final Fantasy Tactics A2." Each job features a unique trait or ability, like focusing powers into a concentrated attack or staging a widespread assault against the enemy. Defensive jobs can support offensive ones, such as White Mages, which can restore an injured jobs' HP, or a Bishop, which can increase nearby units' attack power. The monsters in Vanguard Storm coming in different sizes and with different abilities, such as ones that crawl on the ground and others that fly. Some are resistant to certain attacks, so battle formations must be constantly adjusted to accommodate for the changing conditions on the battlefield. System requirements call for iPhone 2.2 software.